During family game night, it’s fun to sit around the table and kick back with some corn chips and salsa, unfold that game board and set your pieces on the “start” square. You roll the dice. You build a lead and then you risk it all. Sometimes you win. Sometimes you lose. There are plenty of games out there, such as Monopoly, Candy Land, Clue and Battleship. There are card games, word games, fantasy games, sci-fi games. But when game night rolls around, everyone seems to want to play Risk. For those of you who somehow missed out on this in childhood, Risk is an addicting, multi-hour strategy and war game where you spend your time putting your pieces in harm’s way to grow stronger, to spread across the globe. Well, it’s not a globe, per se. Let’s call it a map. Whatever it is, you’re taking over, and largely you’re taking over by doing what the name of the game implies: You’re taking risks. The thing about Risk, though, is that it’s a game. You can stop whenever you want (or when mom gets tired and goes to bed), and when you lose, you simply fold up the board and try again next week. Your life and the lives of your sorority sisters or fraternity brothers are not a game. That’s why risk management is such an integral and central part of sorority or fraternity chapter management. How your chapter manages risk can make or break your chapter and affects every lettered member. It also has repercussions beyond the chapter, influencing your organization’s national image and sending a message about Greek life in general. It’s up to you what that message is going to be. Are you going to show the world that undergraduate Greeks have discipline, moral fortitude and value the wellbeing of their fellow members? Or are you going to show people that Greeks live up to the unfortunate stereotypes we see in movies? Risk management is a big responsibility in any chapter, and OmegaFi wants to help. This is How to Manage Risk in Your Fraternity or Sorority Chapter. One way to avoid a major risk many chapters face without stringent management--that is, drinking-related incidents--is to consider the benefits of running a dry chapter. A risk management chairperson faces many added challenges even though brothers or sisters consuming alcohol are of legal age. There is an increased risk of hazing involving alcohol, drunk driving and other risks of bodily harm brothers and sisters face under the influence. While some risks aren’t directly caused by drinking, it certainly adds fuel to the fire. A risk management person has to collect car keys when legal-aged brothers or sisters drink, they have to watch out for dangerous behavior or when a member or guest drinks, as well as maintaining anti-hazing statutes. Running a dry chapter may not be the solution for everyone, but it certainly removes a powder keg of risks that chapters face. This means members who are of legal age can still go to the club and have a drink as responsible adults, but it takes the onus off of the chapter to manage associated risks of serving alcohol at the chapter house or at chapter events. Despite many universities and Greek organizations across the country adopting anti-hazing regulations, hazing still happens more often than we’d like to admit. Every so often it pops up in the headlines and usually for reasons that are tragic and detrimental for those involved. Trust us when we say you don’t want that to be you. You don’t want a member to be harmed or worse because of your negligence. You may think that can never be you; you have anti-hazing rules at your university. But then why do hazing-related accidents keep happening? The answer is that no one is immune without being proactive. You can’t just rely on hazing rules to keep you out of trouble. Your members need to be educated and participate in the education of others. Participating in national hazing prevention week is a start. Holding events during that week and beyond to raise awareness about the dangers of hazing is important for every chapter. At the very least, information about hazing and anti-hazing regulations should be a part of every new member education program, and members should have periodic seminars and discussions about hazing. Placing the pressure to cover all aspects of risk within a chapter on a risk management chairperson or committee is a surefire path to failure. 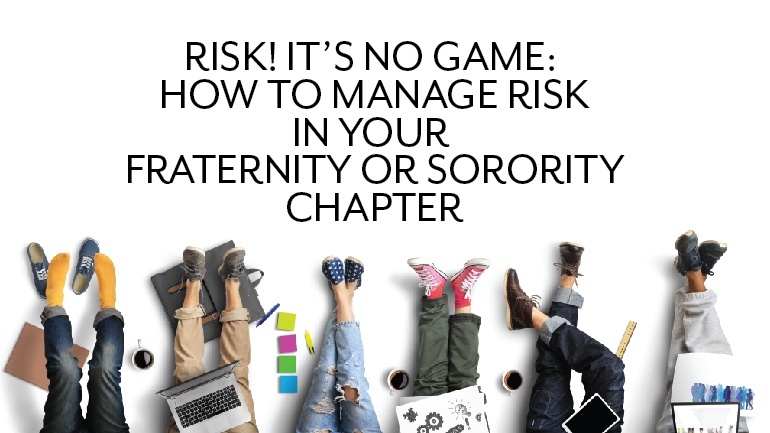 The concept of risk management is on every sister or brother within a chapter, and extends to the chapter executives, house manager, national organization and alumnae or alumni. having a detailed understanding of her or his chapter’s liability insurance coverage. Yet risk management only works when everyone within the chapter works together toward a mutually understood plan, and stays committed to it. A risk management chairperson can’t be the sole enforcer any more than the treasurer can walk around with a baseball bat threatening members who don’t pay their dues on time. It simply isn’t realistic. So long as your chapter places a heavy focus on preventing drinking-related dangers, enforcing and educating about anti-hazing regulations and working together on a risk management plan, your members’ safety is in good hands. What risk management challenges has your chapter had to overcome in the past? What challenges do you see into the future? What works and what doesn’t when it comes to managing your chapter’s risk? Let’s discuss in the comments below!